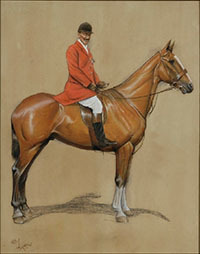 The formation and display of a representative collection of British sporting art at Palace House Gallery Newmarket, and other galleries and houses open to the public. To mount loan exhibitions of British sporting art. To support and publish research on the subject of sporting art. To support young artists and students in their study of sporting art. Through the Trust, more than 50 sporting works of art have been acquired for the Tate Gallery, including a gift of 30 pictures from the late Paul Mellon KBE and the bequest of Mrs F Ambrose Clark. 1986 saw the opening of The Vestey Gallery at the National Horseracing Museum in Newmarket, sponsored by our late patron, Mr Edmund Vestey. The gallery was extended five years later in order to provide a print room and reference library. Our collection, which numbers more than 300 pieces, has been enhanced by the British Council's collection of sporting engravings. The Trust has made donations to the Fitzwilliam Museum, Cambridge; the Grosvenor Museum, Chester; Temple Newsam House, Leeds and the Usher Art Gallery, Lincoln, to help purchase sporting works of art. Since 1986 we have mounted six outside exhibitions of sporting art in London, Leicester and Paris, including a highly successful 25th Anniversary Exhibition at Christie's, London in January 2003 and, most recently, The Engraved Work of George Stubbs at Bonhams, London in 2005. Our publications include A Bibliography of British Sporting Artists with two Supplements; In Pursuit - Early Iconography of British Sporting Art and more than fifty essays on sporting art and artists. The Trust has also commissioned an inventory of sporting art on public display in the United Kingdom. We are proud to be associated with the Society of Equestrian Artists (SEA) via sponsorship of the annual awards for sculpture at their annual exhibition. This year the prize was awarded to Matt Withington for Abyss. We also sponsor a place at their annual Summer School.